The Lake Worth West Community Center has a new staff member – she’s no ordinary staff member! 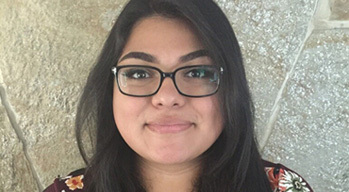 Miranda Aquino-Vallejos joins us as a paid student intern. She is, in so many ways, perfect for the job because Miranda has spent a good part of her life coming to our center and taking part in our Bridges of Lake Worth West programs, said Rhonda Rogers, executive director of Lake Worth West Community Center. Miranda is a 2017 graduate of Lake Worth Senior High School. She has been an active participant of our United Way-funded College Prep program since her freshman year in high school. The Preparing Youth for Tomorrow Program (PYFTP) gave her the support, guidance, and tools she needed to fulfill her dream of going to college. This fall, Miranda will begin her freshman year at Florida Atlantic University where she plans to study business. As a first-generation college student, Miranda was inspired by the stories she heard of other first generation college students who had overcome obstacles to pursue their dreams. Growing up just half a block away from Lake Worth West Community Center, she adopted our center early on as her second home. Through elementary school, she attended homework assistance programs and has fond memories of the gardening and computer programs she attended during her youth. Previously shy and quiet, she credits the PYFTP with giving her the opportunity to develop the social skills and confidence she needed to make positive choices in her life. Over the years, she’s given more than a thousand hours of volunteering at Bridges of Lake Worth West. Now that she’s a staff member of our center, Miranda will continue urging other teens to get involved in community service and to take advantage of opportunities for making college possible. To learn more about our Preparing Youth for Tomorrow Program, click here and call us at 561-649-9600.